Wedding floral design is our primary specialty, accounting for around 90% of our business. We have worked with over two thousand brides to create many lifetimes of memories. We are familiar with most of the local sites and have worked numerous events at each of them over the years. 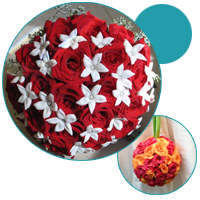 This experience is necessary so that we may guide you in planning your flowers to best suit each venue. We have seen what works and what doesn’t at each unique location. We begin the process by meeting with you during a comprehensive initial consultation. Ideas for your special day may come from a variety of sources, including our extensive portfolio of other events we have done. Within a couple of weeks after our meeting, you will receive a detailed written proposal of everything we discuss. This gives us the framework to create the most beautiful and memorable day of your life. Only a limited number of weddings are booked with us each weekend, depending on size and complexity. Our highly personalized service and attention to your smallest details is impeccable since you are our most important client on your special day. Therefore we restrict consultations to weekdays, when we can focus exclusively on your meeting, just as we are focused exclusively on prepping, designing and delivering weddings on weekends. Please call us to schedule your complimentary consultation. Although we do not have posted regular business hours due to our erratic schedule of weddings and events, we do conduct meetings BY APPOINTMENT ONLY on Mondays through Thursdays from 10 AM to 6 PM, and on Fridays only if we have no weddings that day. Weekends are reserved exclusively for weddings, therefore we are unable to meet on Saturdays or Sundays. Please allow approximately 60-90 minutes for your initial consultation. Although our main focus is floral design, we can assist and refer you to other wedding professionals who specialize in other services, including caterers, cake designers, professional photographers, dj services, lighting companies, printers, videographers, linen and chair rentals, coordinators and other wedding-related services. © Lee Forrest Design, llc. All rights reserved.